Why focus on character education? CASA Academy believes that it is not enough for a CASA scholar to be smart; CASA scholars must also exhibit the character traits necessary for them to succeed in the real world. 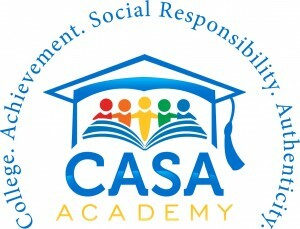 Throughout their education at CASA Academy, CASA scholars learn the values of respect, responsibility, perseverance, integrity, empowerment and enthusiasm as the guiding forces that shape their everyday actions. CASA Academy’s core values are chosen purposefully to guide scholars’ character development and to ensure they are on the path to college. This character education ensures that CASA Academy graduates, who predominantly come from at-risk communities, will enter society with the academic and social skills necessary to succeed in life. How does CASA incorporate character into its curriculum? Character: Each Thursday, CASA scholars participate in a 30-minute character development lesson, during which they learn and practice how to exemplify CASA’s core values. During this time they learn skills such as how to participate respectfully, how to resolve conflicts, and how to value their community. Morning Meeting: Every day CASA scholars engage in a 25-minute classroom morning meeting that is based off of The Morning Meeting Book by Roxann Kriete. During this block of time, scholars greet their classmates by name, share information about themselves, and participate in a group activity that helps scholars learn to work together as a team. These meetings “promote a climate of trust, academic growth, and positive behavior” in the classroom and set a positive tone for the day to come. Community Circle: At the end of each school day, CASA scholars gather together to reflect on their day as a community; during this time, scholars share both positives and areas of growth for the day and discuss how they can make tomorrow even better. Community Meeting: Every Friday morning, the entire school gathers together for a weekly “pep rally” to celebrate learning and positive character traits. During this time, scholars proudly say their classroom college chants, refine academic and social skills, and are recognized and awarded for showing qualities such as compassion and respect on campus. High Five Friday: On Friday afternoons, the entire school gathers again for a weekly celebration of core values on campus. Each staff members “shouts out” specific scholars on campus who have demonstrated respect, responsibility, perseverance, integrity, empowerment or enthusiasm. Each of these “shout outs” includes a specific example of how each scholar showed a core value. We finish the week with a dance party to celebrate smart choices made over the course of the week!